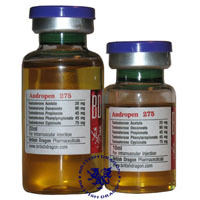 Andropen 275 is a universal steroid, which is considered as one of the most effective steroid drugs. It is represented by a mixture of 5 different testosterone esters. Each of them has unique mechanism of action and a life span. For example, a short-chained acetate ester is quickly released into the bloodstream and has a quick onset of a physiological reaction. The other 4 esters have delayed release, more prolonged action and lower speed of absorption. Due to different speed of release and absorption Andropen provides a prolonged action, so there is no need for frequent injections. As Testosterone is a major sexual hormone of males it can greatly increase libido. Its action is generally anabolic – increase of protein synthesis and thus muscle mass. In high doses it suppresses the synthesis of gonadotropin in hypophysis, meanwhile in low dosage stimulates it. Besides it is used as a cure for mammary gland cancer. Andropen 275 is not recommended for individuals under the age of 18. Women should also avoid it, otherwise it will lead to virilization. Usually the course of Andropen 275 lasts for 42 days with a single injection of 300-600mg a week. Do not exceed the dosage. Consult your doctor before using the drug. In recommended dosages the side-effects are not likely to happen. However in case of overdose gynecomastia is possible. Generally the side-effects of Andropen coincide with side-effects of Testosterone. Post Cycle Therapy is needed after the cycle. Each 20 ml multidose vial contains 20 mg per ml of testosterone acetate, 90 mg per ml of testosterone decanoate, 45 mg per ml of testosterone propionate, 45 mg per ml of testosterone phenylpropionate, and 75 mg per ml of testosterone cypionate. a very powerful mixture of testosterone esters with prolonged action. There is no need for frequent injections.